J.D. Oswald lives in Nottinghamshire, England. 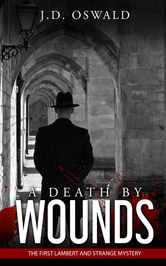 Her latest novel is 'A Death by Wounds', the first in a series of 'Lambert and Strange' mysteries, set in Winchester in the aftermath of the First World War. The novel was shortlisted for the Harry Bowling novel prize in 2014. The second novel in the Lambert and Strange series - The Maiden Garland - is coming soon! 'Henrietta Street' was J.D. Oswald's first novel, exploring love, slavery and portrait miniature painting in Georgian England. In March 2014, Henrietta Street received a special commendation from the judges of the Harry Bowling novel prize. Historical information about 'Henrietta Street' can be found at http://www.jdoswald.com/. Her short-listed story story 'The Greyhound' has been pub J.D. Oswald lives in Nottinghamshire, England. To ask J.D. Oswald questions, please sign up. Description: Current draft of the first chapter of J.D. Oswald's next novel, Death by Wounds. Comments very welcome. We’d love your help. Let us know what’s wrong with this preview of Blood & Beauty by Sarah Dunant. We’d love your help. Let us know what’s wrong with this preview of The Final Solution by Michael Chabon. We’d love your help. Let us know what’s wrong with this preview of The Scent of Death by Andrew Taylor.